We are the leading trading and supplying an enormous range of Box Strapping Machines, which are equipped with belt and roller drive and a mechanical tension adjuster for high speed strapping at our vendors’ end. The offered range of box strapping machines is manufactured using high grade raw material and modern machines in strict compliance with the industry laid norms. It is used for strapping secondary cartons, containers, wooden boxes etc. with PP/PE straps. Two models available viz. High table model and Low table model. 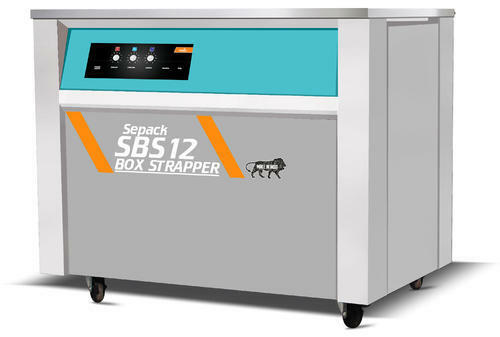 Sepack India Pvt. Ltd., a member of multi products, ISO 9001-2008 Certified SEVANA Group, the leading & the largest manufacturer of Packaging Machineries since 1984. Since last three decades, Sepack has been playing a significant role in Packaging Industry with 12 offices, 58 Service Centres & 836 Dealers across the country. Sepack has direct operations in Sri Lanka & Dubai. Our mission is to provide service within 24 hours. Sevana has a comprehensive range of more than 90 varieties of products which includes Continuous Band Sealers, Dry Ink Coders, Induction Sealers, Filling Machines, Carton Taping, Box Strapping, Stretch Wrapping, PET Strapping, Gravimetric Weigh Dispensers, Hand & Pedal Operated Sealers, Foil Sealers, Bed Sealers, Mobile Sealers, Vacuum Sealers, Online Weighers, Shrink Tunnels, Vacuum Machines, L-Sealers etc. Sevana has customized machineries for Cashew & Tea segment. 3rd Floor, Mathewsons Building, High School Jn.